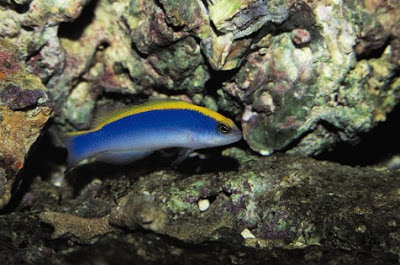 The Sunrise Dottyback or Pseudochromis flavivertex is a saltwater fish with a cobalt blue body that has a bright yellow band from the tip of its nose to its tail. Also known as the Sunrise Pseudochromis or Blue Flavivertex Dottyback, they can be kept in an aquarium setting, but are considered to be only for advanced aquarium enthusiasts. An aquarium of at least 30 gallons with the following water conditions are recommended, 72-78° F, dKH 8-12, pH 8.1-8.4, sg 1.020-1.025. Like most other fish, they like to have a few hiding spots. 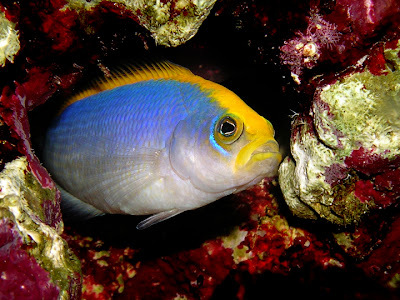 These fish are ideal for a reef aquarium. Sunrise Dottybacks are considered to be a semi-aggressive fish and should only be kept with other Dottybacks if introduced at the same time. They can be fed brine shrimp and frozen foods and will not normally take to flake foods. Sunrise Dottybacks can grow to about 3" in length and originate from the Red Sea. You can watch the Sunrise Dottyback in an aquarium in the video below. If you have any additional information about the Sunrise Dottyback please leave us a comment below.